While serving as Nigeria’s minister of health, Isaac Adewole, MBBS, adjunct professor of Medicine at Feinberg, will continue to collaborate with faculty in Feinberg’s Center for Global Health. Isaac Adewole, MBBS, adjunct professor of Medicine and a native of Nigeria, has been sworn in as the African country’s minister of health. Formerly vice-chancellor of the University of Ibadan, the first medical school in Nigeria, Dr. Adewole has collaborated with faculty in Feinberg’s Center for Global Health on several studies supported by the National Institutes of Health. Since 2010, he has been a principal investigator of the Medical Education Partnership Initiative, a consortium that includes Feinberg that was developed to transform medical education at the six leading medical schools in Nigeria. 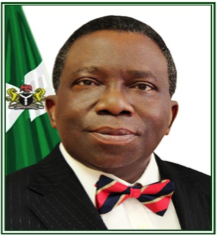 Dr. Adewole has served as a physician and professor of obstetrics and gynecology for several decades in Nigeria. Through his research, he investigates methods for increasing cervical cancer screenings, decreasing unwanted pregnancies and eliminating pediatric HIV in his country. In a recent interview, Dr. Adewole described his pathway to minister of health and some of the plans he hopes to implement through his new leadership role. What was your reaction to being chosen minister of health? The appointment came as a big surprise to me! It came at a time when I was trying to wind down my activities as the vice-chancellor of the University Ibadan, a position I held since 2010. My original plan was to embark on a year leave to rest, write my memoirs and possibly engage in some mechanised farming before returning to the University to continue what I love best – teaching, research and offering medical service. Alas, I was in Canada attending the Federation of International Gynecology and Obstetrics Conference when rumor filtered in that my name had been dropped by the media as one of those being considered for a ministerial position in Nigeria. My reaction initially was disbelief, as I am neither a politician nor lobbyist. Within days, the news was all over, and it then dawned on me that this is another challenge through which I can serve my country. What will be your main responsibilities as minister of health? The Federal Ministry of Health in Nigeria is probably the country’s second biggest ministry after Defence, because it has numerous agencies and tertiary institutions. My main responsibility is to provide leadership, strategic direction and coordinate all federal government health policies in the country. The agenda of the current administration of His Excellency President Muhammadu Buhari, GCFR, is to restructure the health system, implement universal health coverage – one of the most ambitious health programs in Africa. Our intention is to implement one functional primary healthcare center (PHC) per ward in Nigeria. This will amount to revitalising about 10,000 PHCs within the life of this current administration. The ultimate aim is to ensure that all Nigerians have equitable access to qualitative healthcare. To achieve this vision, the Nigerian government will need to mobilize resources to fund this project. How will you continue to work with Feinberg? My current assignment at the Federal Ministry of Health in Nigeria will not hinder my role at Northwestern University. Rather, I will use my current position to strengthen collaboration between Northwestern and the Federal Ministry of Health as well as other affiliated institutions in Nigeria. Eliminating mother-to-child transmission (MTCT) of HIV infection is one of this administration’s “low hanging fruit” projects. We will implement a Global Health Security Agenda in Nigeria. My plan is to leverage on my long-term relationship with colleagues at Northwestern to support my vision of eliminating MTCT in my country.